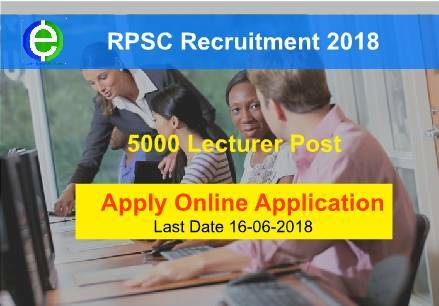 Latest update RPSC requirement invite for 5000 lecturer post the application process will be commarce from 17 May 2018 candidate can apply for the post of Lecturer and Secondary education department of government Rajasthan. This application started on 17 May to 16 June 2018 at 12:00 P.M.
RPSC notifications are release 2018 notification total 5000 vacancy out according to notifications almost lectures and secondary school department. candidate can apply from 17 May 2013 the official website for this online application form rpsc.rajasthan.gov.in. The application process will be commerce my in this month and interested and Eligible Candidate can apply my stuff for the first before 16 June 2018. Before the fill up online application please read carefully full notification advertisement of this vacancy given below link you can download and see this after you can apply for this vacancy. If any candidate applying for more than one position of the Professor, then he has to submit the examination fee for each post from the Principal and for each, the application form will be filled in the bills, so that when you fill another application, this click And after that in the vacant place given below, please apply the application form for the first application form. Only one examination of the first question paper for all the above posts can be conducted by the Commission and in such a situation, only for the second question paper, they will be given separate examination. If a candidate does not have the number of his first application form when filling the second and the money letter, he will be suspended for the second exam. Honorable education station by the Government and postgraduate degree in relevant subject or any other qualification equivalent to it. Note: In the said post, the final year of the academic qualification required to join or join the person will be eligible to apply, but he will have to prove the educational qualification before the examination conducted by the Commission, otherwise he will be ineligible. for more details please read notification. On 17 2018 candidate minimum age should be 21 year and maximum age should be 40 year. For more detail about age limit according to cost category please which state official notification given below download link. First all student need to go to official website rpsc.org standard gov.in on provide apply online linq select. After SSO portal will be open and login SSO portal requirement portal service selected in SSO portal. Candidate will be verified on SSO portal recruitment portal based through one time registration after candidate can apply for this job SSO portal recruitment portal based through one time registration after candidate can apply for this job. When form is open after you submit all required detail in the form and after SSC requirement portal are provided fees payment service. Candidate can submit all payment only SSO portal service not use any other service used for payment. If you pay for Ram fees payment method not well we refund. When you completed all formalities like form fillup and pay your fees payment after take out print out of application form and payment receipt for future reference. If the candidate makes a mistake at the time of filling the form, then in order to correct the mistake, the department has fixed a date, amendment in online application form from 17- 6-2018 to 23-6-2018 at 12:00 pm can do. If You Have Any Question About This Vacancy, Ask in comment box given blow.